The Royal Marines are a pretty nasty bunch, with hundreds of years of experience fighting wars. And sometimes in war, for various reasons, you lose your rifle. The Royal Marines have contingency plans for that, and many of those plans seem to just include a swift dropkick right to the solar plexus. 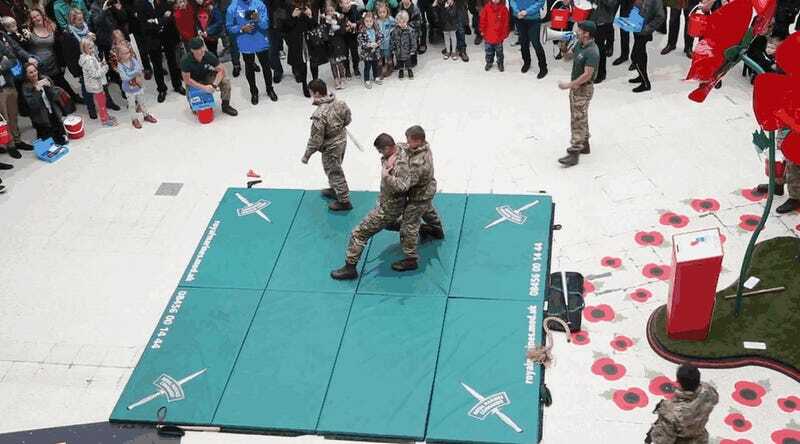 The hand-to-hand combat demonstration was done at London’s Waterloo station as part of Remembrance Day ceremonies, and while yes, it does look like the result of a childhood spent absorbing nothing but the lessons of backyard wrestling mixed with a healthy dose of Road House, I don’t doubt for a second that these techniques are effective. What I’m saying is, please don’t hurt me, Royal Marines.